How do you make the lentil soup? Wash the red lentils with water and leave them in the colander until they are needed. Fry the finely chopped onion in some oil until the onion is translucent and add some salt. Add the garlic and heat the mixture for a few minutes. Add 1,3 liters of boiling water and mix. Cut the potato and the carrot into small cubes. Add the washed lentils, cubes of potato and carrot, paprika and the bouillon cube to the mixture. Let this whole, stirring occasionally, gently simmer in 45 minutes. Heat the cumin seed powder in another pan until you start to smell the cumin. Then add a dash of oil and the tomato paste. Let it simmer for a few minutes until it is a smooth mixture. Add the tomato paste mixture to the soup pan and mix it with a hand blender to form a smooth soup. 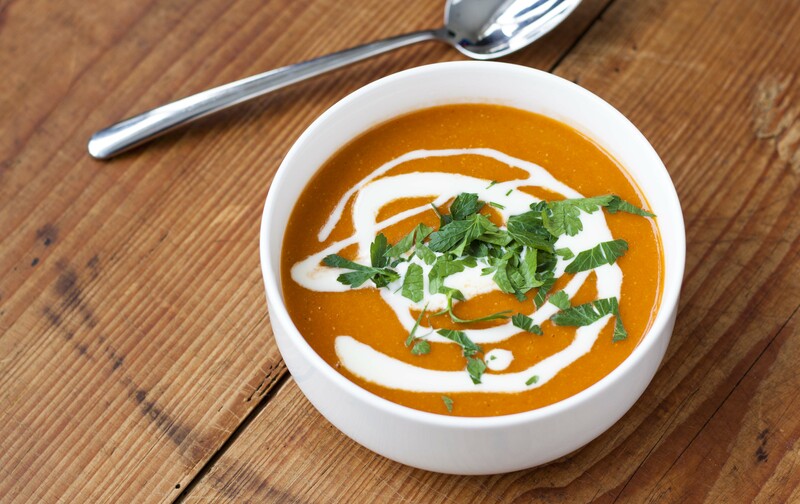 Serve the soup in a bowl with a dash of cream and some parsley over it. Tasty with dark multigrain bread. 1 hours and 15 min.